A Staffordshire man has been recognised for his service to charity after receiving a long service award. 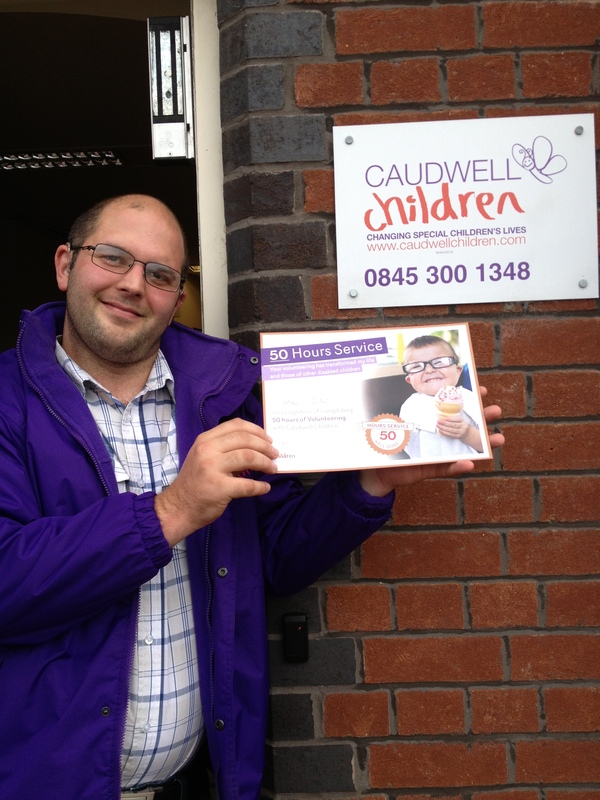 James Ellis has celebrated racking up fifty hours volunteering for Stoke based charity Caudwell Children. The thirty year old from Stoke on Trent first joined the charity in December 2012 and since then has helped deliver practical and emotional support to disabled children through activity days and hospital visits. James who lives in Werrington said: “I came to be involved with Caudwell Children because I always wanted to make that difference to a child and help them achieve new heights. I have witnessed such great things and many amazing children along the way. James is a keen British Touring Car Championship supporter and hopes to climb Mount Kilimanjaro next year as part of a team raising money for the charity. James is the latest volunteer to reach fifty hours volunteering since Caudwell Children launched their reward scheme this year. Volunteers are recognised for 50, 100 and 200 hours of volunteering. Caudwell Children provides a range of opportunities for volunteers including office support, events as well as delivering practical and emotional support to children through their Family Services department. Trudi Beswick, Chief Executive of Caudwell Children, said: “We are very grateful for all the hard work and dedication that James, like all of our volunteers, continues to put into provide practical and emotional support to disabled children. To achieve fifty hours of volunteering is a huge milestone and we are delighted that he is striving to reach 100 and 200 hours volunteering with Caudwell Children.